Frankie Dettori celebrates after winning last year's Prix de l'Arc de Triomphe on Enable, who is favourite to repeat her success on Sunday. Long gone are the days when racing fans spent the autumn counting down the days to the start of the new Jumps season. In fact, save for two or three high-profile meetings, Jumps racing has been so insipid and uncompetitive, prior to the major spring festivals, over the last couple of years, that the latest campaign is approached with much trepidation. Not to worry, though, because Flat racing now fills the autumn void with aplomb. Domestic treats abound and global attractions, such as the Breeders’ Cup in the States (November 2 and 3) and the Melbourne Cup down under (November 6), demand our attention. Here at home, the action started with the four-day William Hill St Leger Festival at Doncaster -- and one much improved from the timid one of the previous year, I must say. Last week’s agenda was dominated by the three-day Cambridgeshire Meeting at Newmarket. The opening day was disappointingly weak, but Friday and Saturday provided informative fare not to be under-estimated. Headquarters takes centre stage again this weekend, courtesy of the Group One Sun Chariot Stakes for fillies, and once more the following weekend, courtesy of the Dubai Future Champions Festival. An excellent recent addition to the calendar, this two-day fixture boasts a host of Pattern events for juveniles, most notably the Darley Dewhurst Stakes and the bet365 Fillies’ Mile, both Group One contests.. But it also features two of the most competitive handicaps of the season in the £500,000 Dubai Cesarewitch for stayers and the bet365 Old Rowley Cup for three-year-old middle-distance horses. Then, of course, all domestic eyes will focus on the eighth Qipco British Champions Day at Ascot on Saturday, October 20. A breathtaking finale to the Flat season, complete with a star-studded cast and more than £4 million in prize money. More on Champions Day in this column over the coming fortnight. 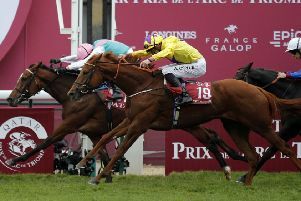 But when you consider this Sunday’s Qatar Prix de l’Arc de Triomphe in France is worth more than £4.4 million in its own right, with £2.5 million going to the winner, it is clear where the jewel in the autumn crown sparkles brightest. Just a glance down the Arc’s roll of honour over its 97-year existence underlines the rich prestige of the contest. Some would argue it is the greatest race in the world. This year, it returns to the newly-named, revamped ParisLongchamp after a couple of renewals in the Chantilly wilderness. And while some British pilgrims have been moaning about a price hike to pay for the spectacular changes to the track, admission of £68, compared to that for the major meetings over here, is hardly excessive for a card littered with five Group Ones as well as the big race itself. Turn the clock back just four weeks, and it looked a shade of odds-on that we were in for a vintage 2018 Arc. But since then, the likes of Poet’s Word, Cracksman, Crystal Ocean and Lah Ti Dar have bowed out, while it has been rammed home that the challenge outside the UK and Ireland is decidedly underwhelming. All of which leaves the race at the mercy of a repeat victory for ENABLE, a la Treve. When John Gosden’s Prince Khalid Abdullah-owned filly triumphed last year, it was her fifth Group One success on the bounce and the superstar status the Investec Oaks heroine attained left everyone foaming at the mouth in anticipation of more this term, complete with duels alongside equally exciting stablemate Cracksman and possibly even Australian wondermare Winx. For various reasons, none of that has materialised, but Enable still justified short-priced favouritism for Sunday’s race with victory on her only start of the campaign on Kempton’s all-weather surface last month. OK, she was receiving 8lb from the runner-up, but that rival did run a screamer when second in the King George, and the 4yo filly couldn’t have been expected to do much more after such a long absence with a minor knee-injury. Jockey Frankie Dettori, taking his 30th mount in the race, is oozing confidence that she can provide him with his sixth victory, particularly as the ground is unlikely to be too quick or too Soft and particularly as she has been handed an ideal draw in stall six. The fact that 20 of the last 25 Arc winners have emerged from single-figure gates is of huge significance. 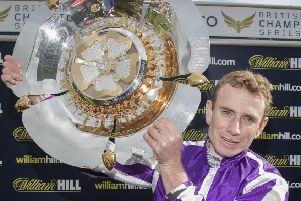 As is the fact that 27 of the last 30 had already landed a Group One prize, which rules out many of this year’s field. And also the fact that seven of the last ten winners have been female. Mind you, seven of the last ten have also been 3yos, which brings William Haggas’s female, SEA OF CLASS, firmly into the equation as one of Enable’s main dangers. Unraced as a juvenile, she has developed along very similar lines to Gosden’s charge. She didn’t take in the Oaks at Epsom but almost certainly would have won it had she done so, and enters the French fray on the back of a striking triumph in the Darley Yorkshire Oaks. The daughter of Sea The Stars, Arc hero of 2009, must race from a wide berth (stall 15 of 19) but that might not be too disadvantageous, given that she is invariably dropped out the back anyway. The draw has not been kind either to Aidan O’Brien’s chief raider, KEW GARDENS, St Leger winner and mount of Ryan Moore. Healthy respect though I have for the son of Galileo, his exploits at Doncaster and at Royal Ascot suggest that 14f is his best trip, and although he landed the Group One Juddmonte Grand Prix de Paris over this 12f distance in the summer, it was a woeful renewal. History also tells us that it is impossible to garner the Leger and the Arc in the same season. Kew Gardens’s stablemate CAPRI confirmed that 12 months ago, although it wouldn’t surprise me to see him run a much better race this time round. He arrives a fresh horse, after being sidelined by a shoulder injury through the summer, and from stall three, under jockey-of-the-moment Donnacha O’Brien, I can see him stalking the probable pacesetter NELSON and holding every chance at the 2f pole. Until, in all likelihood, Enable explodes. Capri also won the Irish Derby last term, but has a lot of ground to make up from his Arc prep race three weeks ago with WALDGEIST, the headline contender from the home yard of Andre Fabre, who has saddled the Arc winner no fewer than seven times, although not since Rail Link in 2006 . Many will not hear of victory for a colt who was beaten in the Group Three Cumberland Lodge Stakes on this same weekend at Ascot only a year ago. But he has always been highly thought of by Fabre and has always hinted that fame and glory were beckoning. I backed him for the Investec Derby last season before he was switched at the last minute to the French version, where he was desperately unlucky to be beaten a short head. His fine performance in the Irish Derby a month later, finishing on the heels of Capri, Cracksman and Epsom winner Wings Of Eagles, proved he has what it takes at the highest level. And this term, he has rattled off four consecutive wins to arrive in ParisLongchamp at the peak of his game. Waldgeist unveiled a career-best performance to land the Qatar Prix Foy last time, barely coming off the bridle to see off three proven Group One performers, including not only Capri but also last year’s Arc runner-up, stablemate CLOTH OF STARS, and he did it on his first outing for 77 days. I don’t mind admitting I have a soft spot for Waldgeist. Indeed I am sitting on bets at 33/1 and 25/1 for Sunday. But if Enable is back to her razor-sharp best, and the Newmarket vibes suggest she will be, then Fabre’s colt could be playing second fiddle.